Today at church we had communion. I often think that every time we eat together, we are having communion. Our potlucks are communion, too. When we have coffee and cookies after church, that's communion. I had not thought before, though, of communion in song. But today I did, and it touched my heart. 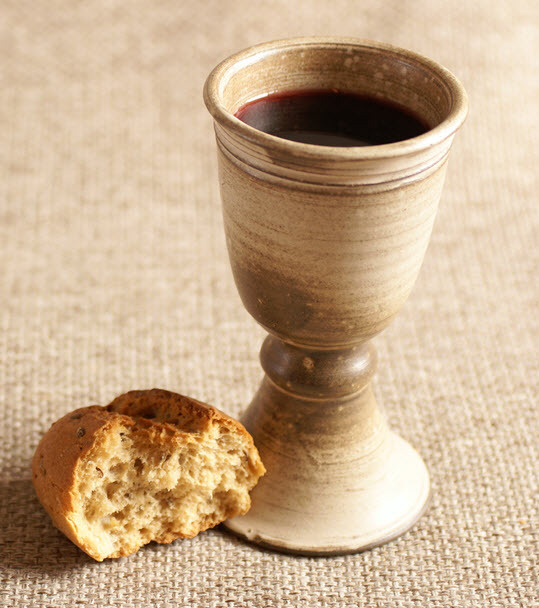 It's our tradition when we have communion for the congregation, after introductory words from the pastor, we all go up the middle aisle to take the bread and juice from either the pastor or an elder standing in front by the communion table. 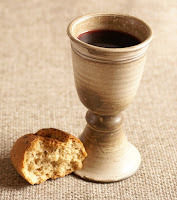 Then we go to the side aisles, bringing it back with us, we sit down, and when everyone is served, we eat the bread and drink the juice (in remembrance of Christ's body and blood, shed for us). During that processional out of and back to our seats, typically our worship team leads us in singing, and most of us sing while we are walking. Today, though, the worship leader played the flute while another instrumentalist accompanied her. There were no singers -- no one vocally leading the singing. The words for each verse and chorus -- "I Love to Tell the Story" -- were projected on the screen but no one sang. I think we were all a little lost without a singing leader. A bit of an aside: It reminded me of years and years ago when an elderly church family member, I'll call him Mr. P, used to play a kind of old, small accordion for "special music" at some of our services. He had several big, strapping grandsons who would set up the folding chair on the stage, and help their grandpa up the stairs, making sure he was safely seated. Mr. P would announce the name of the hymn he'd be playing, for example, "Trust and Obey." He'd play it through, including the chorus, while we all respectfully -- and with joy -- listened. Then he'd say, "Now the second verse." The second verse?! No one was singing anything, we were just listening! But he was singing the words in his mind. How beautiful is that. Back to today. We slowly received our bread and juice and settled back in our seats. Some of us were humming along as we walked, but no one (or at least no one I heard) actually sang the words. By the time I settled back in my seat, the words on the screen were near the end of the third verse. As I started to sing along softly myself, I heard the kind of soft "ssss" sound in "story" as more of us joined in. Slowly, the singing grew stronger and louder until by the last verse and chorus, we were truly singing together.